The Pulitzer Prize and Tony Award winning play, Proof, by David Auburn, will open Wednesday, Feb. 17 at Southern Illinois University Edwardsville’s Dunham Hall Theater. The play will be on stage at 7:30 p.m. from Wednesday-Saturday, Feb. 17-20 and at 2 p.m. Sunday, Feb. 21. Peter Cocuzza, professor of performance in the Department of Theater and Dance, directs the production. His artistic crew consists of Roger Speidel, scenic designer; Nina Reed, costume designer; James Wulfsong, lighting design; Kate Slovinski, property master; and SIUE student Rebecca Haible, stage manager. SIUE students in the production are Gerry Butler, Frankie Ferrari, Olivia Foort and special guest, Mark Bacus. In 2001, Proof won the Pulitzer Prize for Drama and the Tony Award for Best Play. The play is about Catherine, a 25-year-old troubled woman, who has spent years caring for her brilliant but unstable father, a famous mathematician. Now following his death, she must deal with her own volatile emotions. Catherine is forced to deal with the arrival of her estranged sister, Claire, and the attentions of Hal, a former student of her father’s. Hal hopes to find valuable work in the 103 notebooks that her father left behind. The long weekend produces a burgeoning romance and the discovery of a mysterious notebook. But the most difficult problem of all for Catherine is questioning how much of her father’s madness—or genius—will she inherit? General admission is $12 for adults (18 and older) and $10 for seniors (65 and up), non-SIUE students and all SIUE retirees, alumni, faculty and staff. SIUE students receive free admission with valid school identification. Discounted tickets are available for groups of 10 or more. For tickets or more information, call the Theater and Dance Box Office at 618-650-2774 or toll free at 888-328-5168, extension 2774, visit siue.edu/artsandsciences/theater or email theater-tickets@siue.edu. 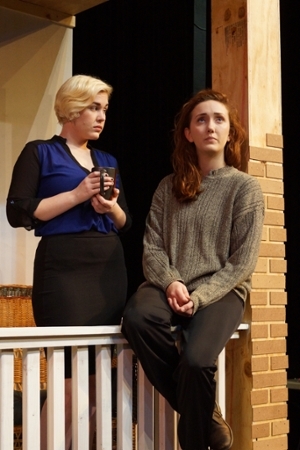 Pictured in one scene are: two SIUE seniors in the College of Arts and Sciences: Olivia Foort (left) and Frankie Ferrari. 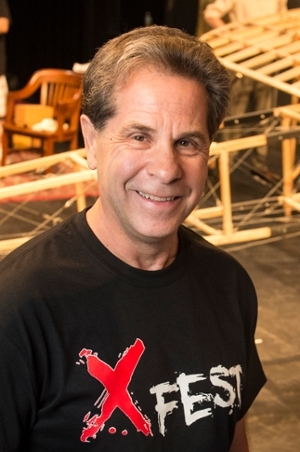 Peter Cocuzza, professor of performance in the Department of Theater and Dance, is director of Proof.